It was introduced to the NEC in 2011 as the first requirement focused on incident energy reduction since Ground Fault Protection of Equipment (GFPE) entered the NEC in 1971. 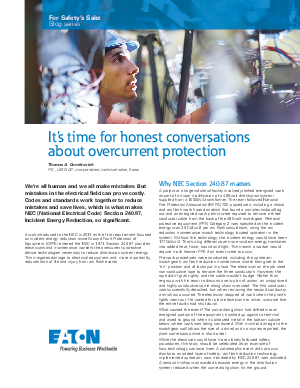 Section 240.87 provides electricians and maintenance workers the overcurrent protective device technologies necessary to reduce distribution system energy. This mitigates damage to electrical equipment and, more importantly, reduces loss of life and injury from arc flash events.